Northern Spark 2017 will illuminate and draw audiences to neighborhoods and public spaces all along the METRO Green Line, connecting Minneapolis and St. Paul. Experience the largest Northern Spark yet, with nearly 70 art projects organized around neighborhood nodes: Cedar Riverside/West Bank, Weisman Art Museum/East Bank, Little Africa/Snelling, Rondo/Lexington, and Little Mekong/Western. In downtown Minneapolis the festival moves from its usual river location to The Commons, the new green space at Portland and 5th, and culminates in Saint Paul at Union Depot, the Green Line terminus in Lowertown. Carlson is an internationally recognized painter and media artist who lives and works in Chicago, IL and Saint Paul, MN. Her Anishinaabe (Ojibwe), French and Scandinavian heritage provides a rich foundation for her investigations of cultural consumption, history and identity, and the intrinsic power of storytelling. Her work is in prominent collections including those of the Weisman Art Museum, the British Museum, and the National Gallery of Canada. The train is a reflection not only of Northern Spark’s connection to the transitway but of Metro Transit’s commitment to sustainability. The Green Line construction project included several stormwater management features that help prevent runoff from entering the nearby Mississippi River, including tree trenches and rain gardens. The Green Line’s Operations and Maintenance Facility in Lowertown also has a stormwater capture system that helps provide water for irrigation and restrooms at CHS Field. “This partnership is a great opportunity to not only bring our community together but also to highlight our organization’s strong commitment to sustainability in all its forms,” General Manager Brian Lamb said. Metro Transit is among just a few transit agencies to earn Gold Level certification through the American Public Transit Association’s Sustainability Program. You can read more about Andrea Carlson’s train wrap design in her interview with NL’s Assistant Curator, Elle Thoni. Free passes will be available to download for travel on Metro Transit the night of Northern Spark. 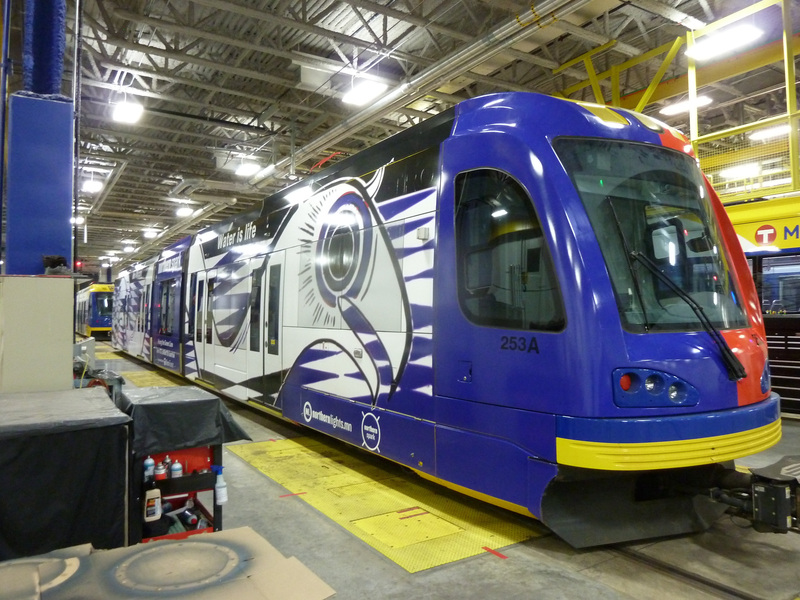 Catch-A-Train Photo Contest – Win two tickets to the Northern Spark Launch Party! 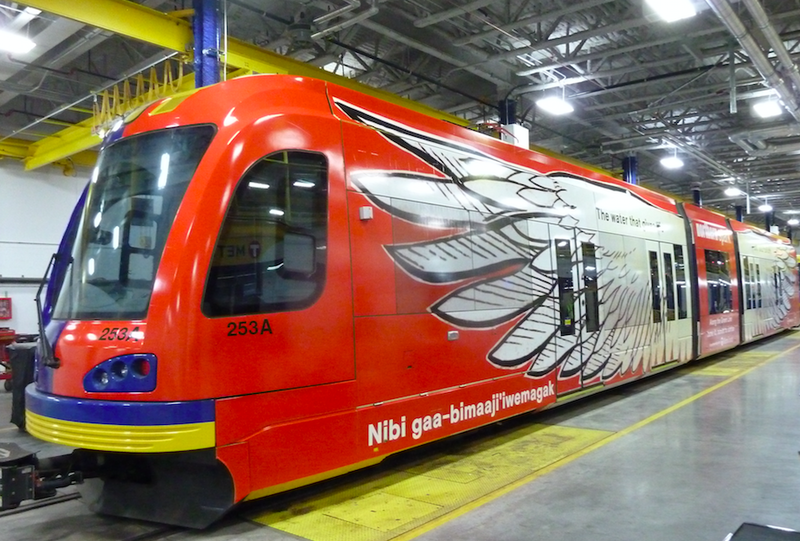 Andrea Carlson’s stunning design is currently speeding along the tracks on the Metro Transit Green Line train between Minneapolis and Saint Paul. We challenge you, talented and creative friends, to capture a photo of our train–and we’ll select the best one to go in our April newsletter, on our website, and shared amongst our social media accounts. The winner will receive two tickets to our highly anticipated Northern Spark Launch Party with musical guests ZuluZuluu, and delicious complimentary food and drinks! To submit to the contest, simply hashtag your photos on social media with #catchatrainNS. Submissions must be posted to social media by March 31st, 2017. Winner will be announced the week of April 3rd. The juror of the Catch-A-Train Photo Contest is Yasufumi Nakamori, new curator of Photography and New Media at the Minneapolis Institute of Art. Announcing Northern Spark Artists and Partners! This year we’re excited to introduce the first Northern Spark Program Council, a leadership group of artists working with Northern Lights.mn and our Neighborhood Partners to inspire participation from artists and residents in cultural communities along the Green Line. In 2017 the Program Council is organizing artists in Little Mekong, Little Africa, Rondo, and on the West Bank to present projects at Northern Spark that respond to climate change from culturally diverse perspectives. We thank them for their insight and participation: Adan Dirie, Sara Endalew, Graci Horne, Filsan Ibrahim, Pa Na Lor, Brittany Lynch, Sagirah Shahid, Aki Shibata-Pliner and Ahmed Yusuf. Our overall partner in bringing Northern Spark 2017 to the Green Line is Twin Cities LISC(Local Initiatives Support Corporation), an umbrella organization supporting neighborhood cultural and economic development organizations in Minneapolis and St. Paul. Twin Cities LISC’s work “brings together key players to address community challenges.” They worked with us to develop the original vision for Northern Spark on the Green Line, an area where they have served as an important force for the health and benefit of small businesses and communities throughout the Green Line Transit Corridor construction project. African Economic Development Solutions’ (AEDS) mission is to generate wealth within marginalized communities and communities of Black heritage in the Twin Cities and Greater Minnesota. Access to key resources, supportive institutional frameworks, and nourishing environments are all necessary elements for creating financial success within marginalized communities. Based in AEDS confronts economic disparities in the communities they serve by providing customized financial literacy training, micro-entrepreneurship training, and by providing homeownership education. Little Africa is an initiative of AEDS in partnership with the Little Africa Development Group, focusing on African immigrant economic assets in three nodal points around primary transit corridors– in St. Paul the district’s core is at Snelling and University. The mission of Little Africa is to leverage the rich and diverse businesses, art, and cultural assets of Minnesota’s growing African immigrant populations to build sustainable wealth within the African immigrant communities. Asian Economic Development Association (AEDA) was created to expand opportunities for economic success for low-income Asian Americans in the Twin Cities. AEDA’s programs help lift people out of poverty and achieve economic stability through small business development, financial education, arts and culture programs, and social justice advocacy. An initiative AEDA, Little Mekong is the Asian business and cultural district in St. Paul between Mackubin and Galtier streets along University Avenue. The district’s name derives from the Mekong River, which flows from China through Myanmar, Laos, Thailand, Cambodia, and Vietnam, and connects the cultures of Southeast Asia. Aurora St. Anthony Neighborhood Development Corporation (ASANDC) is based in St. Paul’s historic Rondo neighborhood, and with Neighborhood Development Corporation launched the Rondo Arts Cultural Business District in 2013. Today ASANDC hosts a variety of social, economic, housing, and commercial development programs for Aurora St. Anthony, Frogtown and Summit-University residents of all ages, with a mission to foster positive relationships within and between the neighborhoods we serve and to support our members in affecting the quality of life in their communities. The West Bank Businesses Association (WBBA) exists to engage the business community in the responsible economic development of the West Bank district while preserving the unique character and heritage of the Cedar Riverside neighborhood in MInneapolis. WBBA is dedicated to preserving the neighborhood’s strengths while identifying and helping address the neighborhood’s changing needs, bringing positive improvements to all while serving as a resource for all of the business and commercial property owners on the West Bank. The Climate Rising Collaboration, made possible with the support of the McKnight Foundation, pairs artists with organizations working directly on issues concerning energy, environmental justice and climate change. Climate Rising Collaborations partners include Climate Generation, MN350, Neighborhoods Organizing for Change (NOC), Take Action, Minnesota Center for Energy and Environment (CEE), and Conservation MN. 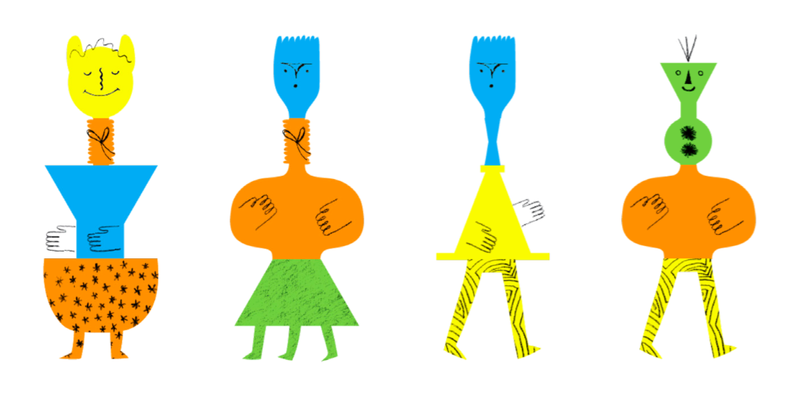 In each collaboration, artists work with partner staff and volunteers to creatively connect their artistic practice and interests to the organization’s focus areas. Partners contribute resources and expertise to help each project reach its zenith at Northern Spark 2017. We at Northern Lights.mn believe that in order to develop realistic and hopeful maps for the future in the face of real and growing climate chaos, artists, scientists, policymakers and activists will need to collaborate. These projects are incubators for what we hope will be more collaborations to come.